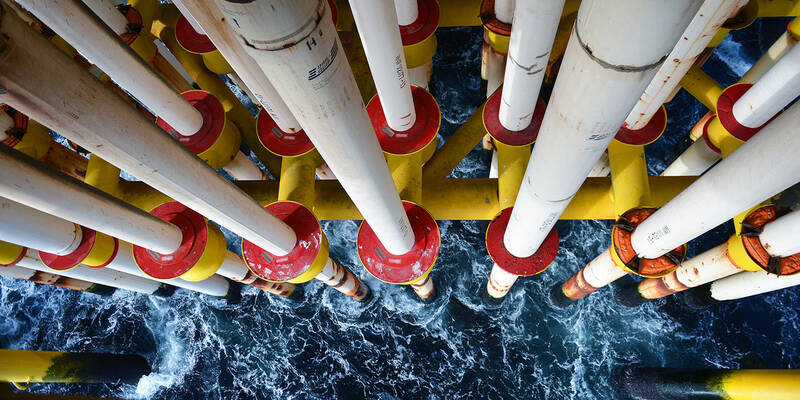 The Norwegian Petroleum Directorate’s estimate for total proven and unproven petroleum resources on the Norwegian Continental Shelf is about 15.6 billion standard cubic metres of oil equivalents. This is 24 million more than at 31 December 2017. Of this volume, 47 per cent has been sold and delivered. Around 47 per cent of the remaining resources have not yet been proven. Resources is a collective term for all oil and gas that can be recovered. The resources are classified according to their maturity, i.e. how far they have progressed in the planning process leading up to production. The main categories are reserves, contingent resources and unproven resources. The Norwegian Petroleum Directorate’s basic estimate for total proven and unproven petroleum resources is about 15.6 billion standard cubic metres of oil equivalents (Sm3 o.e.). Of this, 7.3 billion Sm3 o.e., or 47 per cent, have been sold and delivered. The estimate for resources that have not yet been proven is 3.9 billion Sm3 o.e. This has been reduced by the added growth of resources from new discoveries in 2018, approx. 60 million Sm3 o.e. It is expected that 8.3 billion Sm3 o.e. remain to be produced. Of this, 4.4 billion Sm3 o.e. are proven resources. Download all resource account tables per 31.12.2018. Oil and condensate are quoted in million standard cubic metres (Sm3). NGL is quoted in million tonnes, and gas is quoted in billion standard cubic metres. The conversion factor for NGL in tonnes to Sm3 is 1.9. Total oil equivalents are stated in million Sm3 o.e., 1000 Sm3 gas = 1 Sm3 o.e. Original recoverable petroleum resources on the Norwegian continental shelf as of 31.12.2018 – Oil and condensate are quoted in million standard cubic metres (Sm3). NGL is quoted in million tonnes, and gas is quoted in billion standard cubic metres. The conversion factor for NGL in tonnes to Sm3 is 1.9. Total oil equivalents are stated in million Sm3 o.e., 1000 Sm3 gas = 1 Sm3 o.e. What is produced on the Norwegian shelf? The production (well stream) from different reservoirs contains oil, gas and water in various combinations. To get marketable products, the production from the reservoirs must be separated and treated. The production from different reservoirs varies from oil with low gas content to almost dry gas (methane with only small amounts of other gases). Crude oil is a fluid that is a combination of different types of hydrocarbons. The composition varies from field to field, and the quality of the oil, including how light or heavy (viscous) the oil is, depends on the composition of the hydrocarbons as well as the contents of other substances, such as wax and sulphur. Rich gas, or crude natural gas, is a mixture of various gases. When necessary, the gas is separated from the oil before the rich gas is treated in a processing facility that separates the dry and wet gas components. Dry gas is often referred to as natural gas, and consists mainly of methane, but also a little ethane. 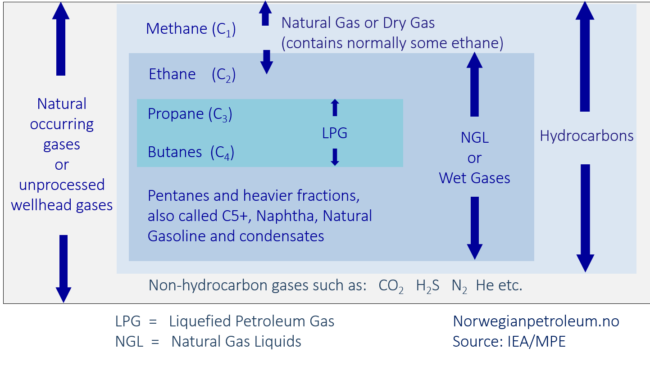 Wet gas, or NGL (Natural Gas Liquids), consists of a mixture of heavier gases (ethane, propane, butanes and naphtha). In addition there are heavier condensates which some classify as a separate product. Naphtha and condensate are liquid at room temperature, while the lighter wet gas components can be made liquid either by cooling or adding pressure. Not all gas that is produced is sold. Some of the gas is used to generate power on the fields, and small amounts are flared for safety purposes. On some fields, gas is reinjected into the reservoirs. Reinjection is often used to maintain reservoir pressure and displace the oil. This results in efficient recovery of the oil, and the gas is stored for possible recovery in the future. Reserves are recoverable petroleum volumes that have not yet been produced, but where a decision has been made that they will be produced. This applies both to resources where the authorities have approved a Plan for Development and Operation (PDO) and the resources that the licensees, the companies in the production licence, have resolved that they will produce, but have not yet secured the necessary approval from the authorities. At year-end, reserves amounted to 2 996 million Sm3 o.e. 54 per cent of this is gas. The gross reserves, or the estimate before production has been deducted, increased by 138 million Sm3 o.e. compared with the previous year. The reasons for this solid increase are reserve growth on several producing fields, submission of the PDO for Johan Sverdrup construction phase 2 and the Nova field. Production in 2018 amounted to 230 million Sm3 o.e. This entails a net reduction in reserves of 93 million Sm3 o.e., or about 3 per cent. Contingent resources are proven oil and gas which the licensees have not yet decided to produce. Petroleum volumes in potential improved recovery projects are included in this category. At year-end, contingent resources amounted to 1 367 million Sm3 o.e. Resources that have been assessed as not being commercially recoverable are not included in the accounts. Each year, decisions are made to develop some of the contingent resources, which are then moved to the reserves category. 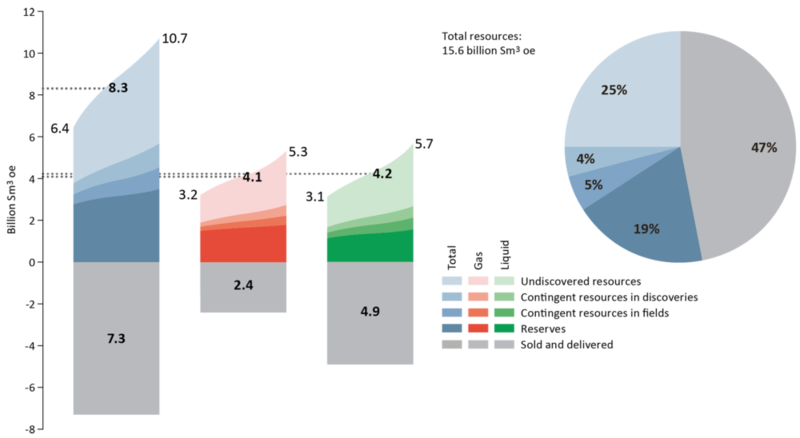 The growth in the contingent resources category comes both from new discoveries and from amended resource estimates and new opportunities in fields and discoveries. In 2018, exploration activity yielded a resource growth estimated at 60 million Sm3 o.e. 27 wildcat wells were terminated, and 12 new discoveries were made; three in the Barents Sea, three in the Norwegian Sea and six in the North Sea. Evaluation of many of these discoveries has not been completed; and the estimates are therefore very uncertain. As regards five of the discoveries in 2018, development is considered not very likely, and the resources in these discoveries are not included in the accounts. Resources in discoveries have increased by 60 million Sm3 o.e., to 660 million Sm3 o.e. This increase can be attributed to resource growth from seven new discoveries in 2018. In addition, eight discoveries where development was previously deemed to be unlikely have now been considered for development. However, reduced resource estimates in discoveries and submission of the PDO for Nova resulted in the increase not being larger than 60 million Sm3 o.e. Contingent resources in fields amount to 708 million Sm3 o.e., or 16 per cent of the remaining proven resources. In 2018, contingent resources in fields were reduced by 114 million Sm3 o.e. compared with the 2017 accounts. 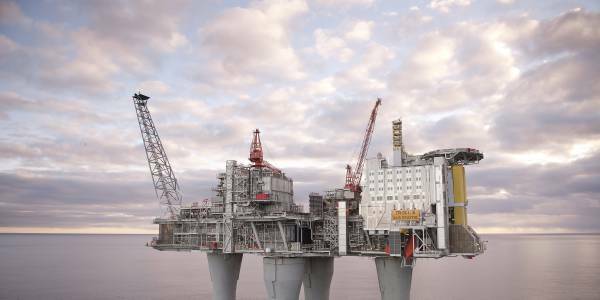 The reduction can mainly be explained by the fact that a decision has been made to develop construction phase two for the Johan Sverdrup field. Unproven resources include oil and gas that probably exists and can be produced, but have not yet been proven through drilling. The resource estimate for the unproven resources was not updated in 2018. Such updates are conducted every other year. The next update will be in 2019. The unproven resources are estimated at 3 940 million Sm3 o.e. This is a reduction of 60 million Sm3 o.e. compared with the resource accounts for 2017, and is approximately equal to the growth from new discoveries in 2018. Unproven resources account for about 47 per cent of the total remaining resources on the Norwegian Shelf.